It was my first day on a new placement, and John (not his real name) wouldn’t eat his breakfast. He hadn’t touched his cereal, and no amount of gentle persuasion had convinced him to try more than just one bite of toast. I’d made it according to the order form – coated in a thick layer of what I was told was his favourite jam – but he simply pushed the plate away. Just as I had given up, defeated in my breakfast battle, a domestic popped her head in the door. ‘You’ve cut his toast wrong, love,’ she said. John had Down’s syndrome and was non-verbal. For him, such a seemingly inconsequential detail meant everything when it came to his breakfast. So the toast was made again, cut the way he always had it, and within minutes his meal had been scoffed down. Caring for John over the following weeks gave me a lot to think about nutrition. For a start, he often ate the same three meals every day, occasionally supplemented by a treat on a ‘good’ day. Some meals were made specially for him. Otherwise, with a changing menu they would not have been consistently available. For most patients such an unvaried diet would be a cause for concern, but getting John to eat anything was a challenge. His family and the staff understandably prioritised what he would eat over what he should eat. John’s family were often present at meal times, which was a blessing on a busy ward where staff didn't always have the time to help him with his meals. Eating could be a lengthy process, but with encouragement John always got there in the end, with mealtimes often filled with celebrations when a drink was finished or a spoonful taken. Caring for John reshaped my approach to mealtimes. It emphasised how important the ‘little’ things can be and highlighted how food presentation can matter as much as content for some people – my gran would be put off by a big plate of food, for example, and was far happier with smaller portions. If a patient hasn’t eaten much at a mealtime it is essential to delve further into the reason why. Is it the meal itself? Perhaps it is the influence of illness, disability, age or environment? There are countless reasons why a patient may not be eating when in hospital. For John, if his toast was cut the wrong way it was enough to put him off his meal, even though he was clearly hungry. My experience with John also underlined how important it is to remember that eating something is often better than eating nothing at all. Our drive for healthy eating can sometimes leave behind those who rely on high-calorie food to compensate for otherwise poor appetites. But what struck me more than anything was the importance of finding the time to care, with the same being true for many patients with learning disabilities. We were fortunate to have the support of John’s family, but for patients without this support it is down to the nursing staff. The body needs fuel to heal. This can be a prolonged process without the appropriate nutritional intake. 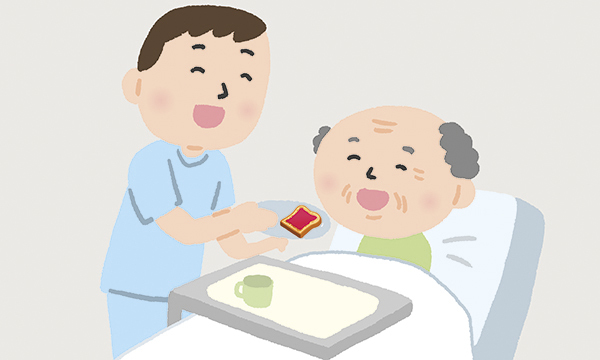 Finding time to help patients at mealtimes is no easy task on some wards. That’s why we as nursing students are fortunate to be supernumerary. I had the time to take and I made the most of it. I’ll remember my experience with John. In such a busy health environment, staff still provided him with care that was tailor-made, from delivering a unique menu to giving cheers of encouragement for a finished milkshake, every member of staff added something unique to John’s time in hospital. The needs of his family were also addressed through respite support, and they became part of the team. I was privileged to be a part of John’s care journey, and while many lessons were learned, one stands out more than most – we all have something to contribute in delivering person-centred care.